Recently, I had a few days to myself in the city. It was all my own, I was able to run around and explore like it was my first time (though I’ve lived here my entire life). Here are some of the places I checked out, and some tips for having a chill New York day of your own. Wake up early! You may want to sleep in, but waking up early has real perks. Get an early work out in (F45 or Xtend Barre anyone? ), and start the day with a bang! Me, personally, I checked out The Future of Sports immersive fitness activation in Williamsburg. 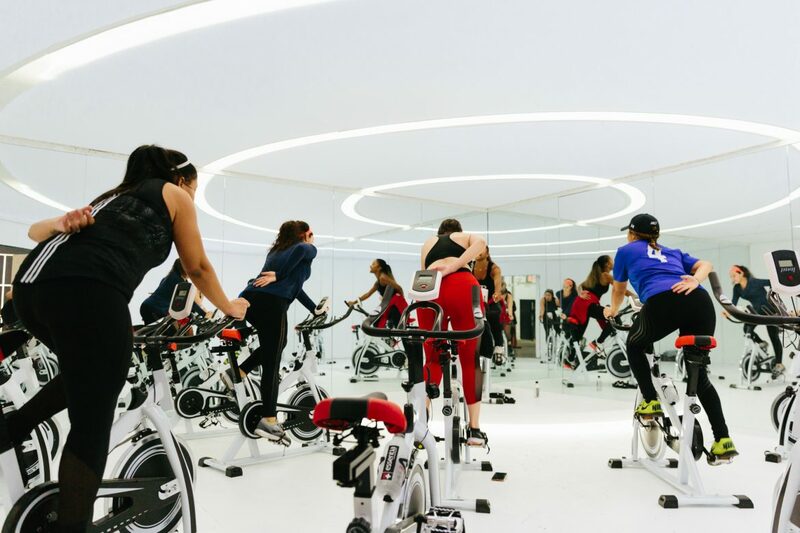 The brainchild of Nicole Pinedo, a DC native who wanted to create an environment fusing together art, culture, and sports by creating a dynamic fitness initiative that encourages a healthy and engaged lifestyle. The space will be open until January 6th, 2019 and will offer a variety of fitness and art programming throughout its lifespan. When I checked it out, I was treated to classes by Y7 Yoga, Spiked Spin and Gloveworx a state-of-the-art boxing studio and athletic performance facility combining boxing training with strength and conditioning. Gloveworx is a California-based workout that will soon be gracing New York with its presence! Take advantage of non-peak time wellness appointments. Most spas in New York book up quickly, book an appointment mid-day at one of the city’s best – Glo Skin & Laser. I booked Dermalinfusion to help my skin get back to its normal, healthy, vibrant (OK it’s never really vibrant, but a girl can dream) self. The esthetician customized the serums used based on my skin type, and what I needed, it was bliss! The treatment, otherwise known as a Silk Peel, started with a microdermabrasion-type tool that exfoliated my skin while also injecting the specific serums into my skin. This is great for anti-aging, hyperpigmentation, dehydrated skin, blemishes, and rough skin texture. After that, a glycolic peel was applied, followed by a mask to neutralize and relax my skin (and my mind, it smelled so good!). Similar to the above, and maybe the common theme of the tips, take advantage of the off-peak times, especially for restaurants! After my aforementioned workout, I walked down the block to Sweet Chick, the comfort food restaurant known best for their amazing food, vibe and all-day cocktails. The no-reservations restaurant is usually impossible to get into and, on this random mid-day Friday was still packed, but my friend and I were able to grab a seat at the bar, and we were more than happy with that! We noshed on chicken and waffles, and Bloody Mary’s that could have been meals unto themselves. Explore! Take advantage of the time. It’s all about ‘chilling’ right? Walk around and discover somewhere new. I decided to walk back from Williamsburg to my Lower East Side apartment and detoured many times. One time, an amazing vintage shop, Awoke Vintage. Once inside, I was immediately hooked. Purchasing an amazing pair of sunglasses and chic gold earrings, I could have splurged more but I’ll save that for another article. Recruit a friend! The best part about living in New York is that at any time, someone in your friend group (or extended friend group) is bound to have some time to spare too. Exploring the city solo is great, exploring the city with a friend is sublime! How would you spend your off day in NYC? ← How to Design Your Dream Relationship and more with the AstroTwins!